This page of the Primary Documents section of the website collects together archive source documents originating in 1917, the tumultuous third year of the war which heralded two revolutions in Russia, French military disaster along the Aisne, severe British difficulties at Passchendaele - and perhaps most notable of all, America's decisive entry into the war. 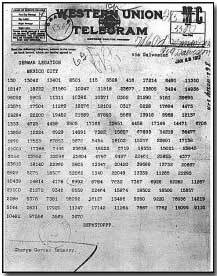 Included among the following documents is the transcript of the decoded Zimmermann Telegram which helped bring about America's entry into the war; President Wilson's speech to the U.S. Congress declaring war against Germany; and Tsar Nicholas II's abdication proclamation. The list presented below - with each entry accompanied by a brief summary of its significance - is sorted by date, with earlier documents listed first. Alexander Guchkov on Unrest in Russia May - War Minister's warning of imminent "abyss"